Making a plan of action and reviewing how well it’s working are the last two steps in the four-stage process to help producers tackle tail biting – record, assess, act and review. Once a producer and their vet have identified what is likely to be increasing risk of tail biting, they can discuss ideas on what action to take. They will be different for each farm. The areas where management changes could be made include enrichment, ventilation, cooling measures, pig health, keeping pigs warmer via solid gates or covered lying areas, regular cleaning of drinkers and training of stockpeople. There are many potential solutions on AHDB’s webHAT (husbandry advisory tool), suggested alongside the risk factors they are relevant to, but this is by no means an exhaustive list. “They are practical ideas which might turn out to be exactly the right actions to take or, if they don’t, they might still trigger different ideas that are more effective. If it’s not on the webHAT, it doesn’t mean you shouldn’t try it,” Mrs Mellor said. Whatever changes are in your action plan, remember to include timescales for putting them in place and reviewing them. There’s a simple action plan template on the webHAT that may be helpful. It’s also worth highlighting again that it may not always make sense to work on the first risk factor that is identified or to focus on that one alone. For example, if high numbers of hours of sunshine or cold pen temperature have a high level of association with tail biting, it will depend on what time of year it is as to how much effect they are having. Working on other, smaller or less obvious risks may enable overall risks to be significantly reduced more quickly. Providing additional or different environmental enrichment is often the first course of action to be considered and enrichment is also a legal requirement. To help with enrichment, AHDB’s guide to Environmental enrichment for pigs provides guidance on options for all types of housing. It discusses the types of enrichments most suited to each system, including their properties, how to present the enrichment, quantities, ease of installation, maintenance and costs. As well as being of a suitable type, enrichments need to sustain the pigs’ interest, encouraging their exploratory behaviour over time, so they should be regularly replaced, replenished or rotated with different materials. can include sisal rope, cardboard, strong hosepipe and root vegetables (though parsnips should be avoided as they are toxic to pigs). There are full details and practical considerations in AHDB’s guide. Mrs Mellor said: “Another possible area to review is water hygiene and infrastructure, which is a noted risk factor for tail biting and can affect health, feed intake and behaviour. “If there’s competition at drinkers and pigs are guarding their tails or tails are being bitten while drinking, water availability is something to look at. It should also be reviewed if pigs are ear or flank biting.” There is comprehensive guidance on checking whether the right quality and quantity of water is being provided to pigs on AHDB’s website or you can contact the knowledge exchange team. As a basic starting point, producers should ensure all drinker points are functional, that water flow is correct (eg 1 litre/minute for finisher pigs) and that all drinker points are clean and the pigs choose to use them. Don’t forget to measure flow rate at the most sensitive point – the end of the line – and after you have given residual water in down pipes time to leave the system. This then provides a good indication of the flow rate. If you don’t do this, you may get a falsely high flow rate. Useful changes can often be made to ventilation as well and, while there may not always be quick fixes, there is a lot of helpful advice available from manufacturers and AHDB. The risk of tail biting can increase at times of year when pens/buildings experience big temperature fluctuations. Drafts, chilling, cold and damp days increase risk factors. Problems can arise if the ventilation settings are not circulating air adequately, or where a change in wind direction creates drafts or affects ventilation patterns. For automated ventilation systems, settings should be checked to ensure all pens receive sufficient air changes. It’s also worth paying special attention when cleaning buildings before re-stocking, using the opportunity to ensure all fans are working at the correct capacity for the size of the incoming pigs. 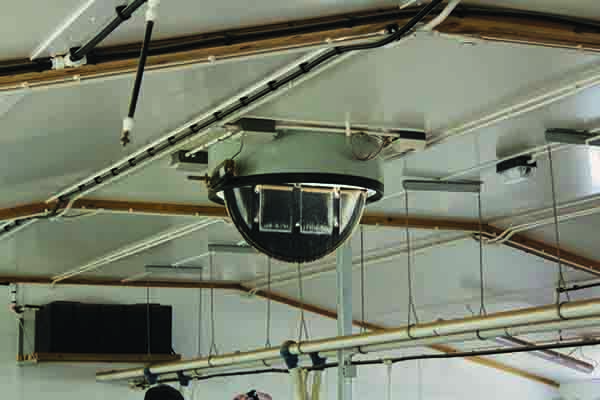 Thermostats need to be calibrated regularly and, if settings can be altered to better manage daytime temperatures, producers must ensure that correct settings are resumed overnight so that pigs don’t feel cold air over the lying area. Hot weather also creates issues. In straw-based buildings, producers can consider additional ventilation measures to improve airflow through the pens, such as replacing solid gates with barred gates, opening additional windows and removing galebreakers. Other measures to help cool the pigs include sprinkler systems or misters (provided there is sufficient airflow to remove humid air). Shading windows and other air inlets reduces the amount of warm air entering the building. Once the action plan is under way, producers should review whether the changes are making a difference and continue to monitor early warning signs and outbreaks of tail biting – this ‘loops’ the process back round to the recording stage. Mrs Mellor said: “Producers can review the action plan quarterly with the unit vet and discuss whether the plan is having any impact, either positive or negative. It’s also worth checking that the changes put in place are being maintained consistently, such as straw levels. Template recording sheets for early warning signs are available to download on the webHAT and some vet practices also have versions of this. “What we don’t have yet are any strategies to help stop an outbreak once it is happening,” Mrs Mellor added. “It’s still the ‘Holy Grail’ and producers in other countries struggle with this, too. “That brings us back to the reason we want to encourage and support the industry to take a fresh look at how to reduce the risk in the first place.